The Divnick™ Whole-In-One Adjustable is most like an iron. It is the shape of an iron, and replicates every loft in a full bag, plus half lofts. But there are some things the DIVNICK™ doesn't do as well as conventional clubs and we want you to know what they are before making a purchase decision. 1) It doesn't hit as far as a driver. Distance is a function of club-head speed. The longer the club, the larger the swing arc, and the faster the head speed. The standard 38.5" model is the length of a 4-iron, so it is like teeing off of a par 3 hole or any time you use your 4 iron. You can lower the loft to a 3, 2, 1, or the "D" driver loft, but that generally only makes it more difficult to hit solidly. The lower the loft, the smaller the effective sweet spot, just as with all clubs. Most people get the best distance when they match the 4-iron loft with the 4-iron length. RECOMMENDATION: Use the forward tees so you can still reach the green in regulation. Make it a fun round that will provide lots of opportunities for pars and birdies. See more testimonies and reports here. For those who want driver distance and portability, we make telescopic drivers with surprising distance and accuracy off the tee and fairway. 2) The other extreme club in terms of length and head-shape is the putter. The DIVNICK™ head is not nearly as heavy as a putter head, and it is on a much longer shaft. It does have a putter loft and has 3 alignment lines on the back of the head to help line up the putts, but it takes a little getting used to. Most people choke down to the bottom of the grip and take a fairly normal putter stance. We also offer telescopic putters for those who want the more traditional look and feel, but still want travel portability. 3) Weight is another huge difference. The lightest club in your bag is your driver even though it is the largest and longest. The heaviest is the putter. Most of the weight difference is in the head. Wedges are very heavy and on short shafts for extreme control in the sand and tall grass. Since the DIVNICK™ is quite a bit lighter than those clubs, it won't slide through the grass or sand as easily as your sand wedge. It has a standard 4-degree sole bounce when adjusted to the first sand mark (52-degrees), but most people agree that it takes some practice from the sand. We offer telescopic wedges for those who want maximum performance out of the sand. 4) The lie angle of the head to the shaft is about half way between a normal putter and long irons. Therefore, with the lower lofts the toe is a little "up". With the putter loft and normal putting stance which has the club head closer to your feet, the heel will be "up" a little. Based on our robot machine tests and player feedback, this does not have a major impact on the flight of the ball, so it is just something you'll notice at first, then get used to. Nevertheless, for those who want ultimate consistency with long fairway shots, we offer telescopic hybrids. As an example, it is a little like comparing a professional mechanic’s tools to a Swiss Army Knife, or pocket multi-tool. The multi-tool has various cutting blades, a saw, a flat-blade screw driver, a Phillips screw driver, little scissors, pliers, and more. They are very convenient...easy to carry in your pocket or to have in your car in case you ever need do a repair. For their purpose, they can't be beat. These pocket tools were popularized by the MacGyver television series who used his to get out of the most perilous situations. But a multi-tool won’t do each of the tasks as well as a single tool designed for that specific job. Similarly, you can play the whole game with our adjustable golf club. It travels free. You can have it handy for a quick, unscheduled round. You can walk directly off the green to the next tee like a pro. Experiencing golf with this club is something that can't be fully appreciated until you do it. It is wonderful. But it won't hit every shot like a full set of variable length, weight, and shaped tools. Some people are surprised that we acknowledge that so openly. But there is no reason for us not to inform you of all the facts. We have less than a 1% return rate which is amazing for a product people purchase without being able to test first. That is, at least in part, because we describe it so thoroughly...including the things it doesn't do as well as a full set. We want you to be fully informed. Offsetting these disadvantages is its portability and its ability to be adjusted to half lofts for super distance control. You can take a full swing from anywhere on the course and let the loft-setting produce the distance… It's really fun to be close to the green with a tree or a trap between you and a close pin, and loft the head up to a 70 or 80-degrees, take a full swing, and watch the ball shoot straight up into the air and stick where it lands. You don't have to "open the face" for flop shots by turning the face outward and aiming away from the hole like the pros do...which is difficult for amateurs. With the Divnick Adjustable, you can adjust it to higher lofts and keep the face straight toward your target. 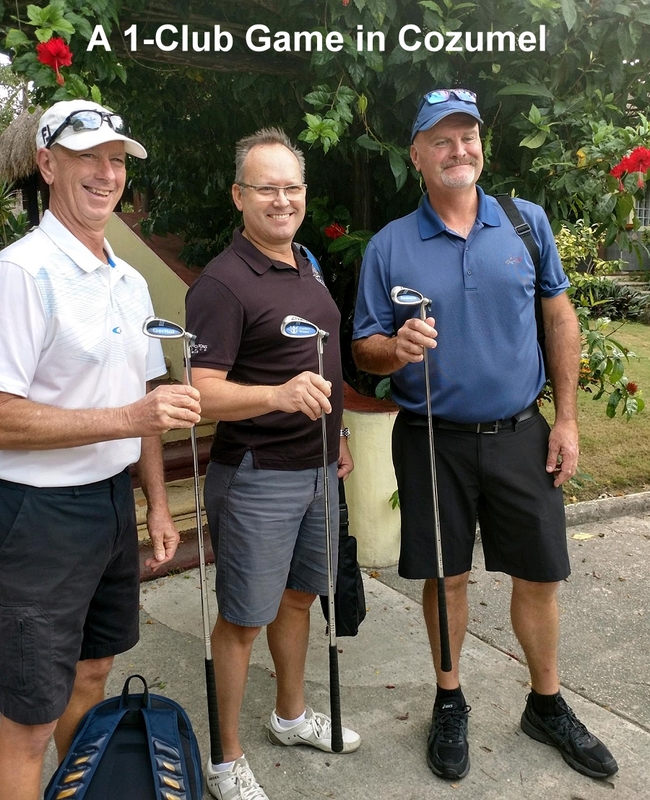 Also, it has long been known that playing the game with the same length club allows you to "groove" your swing and improve your consistency, which is one of the reasons several thousand of our customers have excitedly told us that they have lowered their score with the DIVNICK™. Of course, these would typically be people who aren't great off the tee. As mentioned above, if you want the best of the two extremes in club length and head shape to go along with the DIVNICK, we make telescopic drivers, hybrids, wedges, and putters...along with irons and custom telescopic shafts on your head! Most people who get additional telescopic clubs get our "Tee & Fairway" Driver, and a Telescopic-Putter to go with their Adjustable. 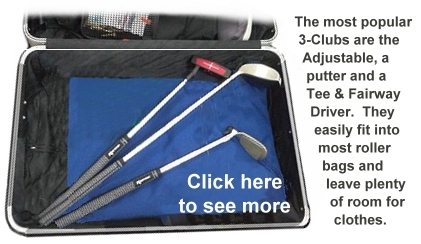 With these 3 clubs, you can bomb it off the tee and hit long fairway shots with the TF Driver, replicate all your irons and wedges with the Adjustable, and putt with a normal length and feel with a Telescopic Putter...and they all fit into a checked roller bag so you don't have to pay all that money to the airlines to check a full golf bag! Remember, "Our Clubs Fly Free!" Since the Adjustable won't do everything as well as a full set, what are the trade-offs? The big one is convenience and cost, especially when traveling. I like to share the experience of my cousin. We play a lot of golf together, and he loves the 1-club approach to golf...except for putting. While most people can putt pretty well with it, he is not a tall person and it feels too long for him as a putter. For a while, every time we came to a green, he would start to grumble. I finally said, "Why don't you carry a putter?" His immediate response was, "No way, I love walking the course with just one club!" There you have it. A trade-off of significant convenience. Most people won't use the Divnick Adjustable for serious competitive golfing. It doesn't conform to the USGA or Royal and Ancient Rules of Golf. Most people us it for convenience and fun. It is like having a caddie...all you are carrying is 1 club. After putting, you can walk off the green straight to the next tee. It is a wonderful way to play golf. Many customers keep it in their car in case they have a few extra minutes to practice or get a quick round in when they see a golf course. If our shaft and casting technology had been available several decades ago when the Brassie, Mashie Niblick, and Spoon evolved into 14 clubs, it is possible that pros would be carrying only one club today. But of course, that is not the reality, so only a point of reference. The USGA doesn't allow clubs to have moving parts. The DIVNICK™ replicates far more than 14 clubs, and of course, it has moving parts. We have been asked if we are going to pursue the USGA in court to force them to allow the DIVNICK™ to be used in tournaments. We believe we could make the point that, although it has moving parts, none of them move during contact so there is no mechanical "launch" advantage, which is the logical reason for that rule. But we support the USGA, the Royal and Ancient, and PGA's role of protecting the traditions of the game so that records and feats of the modern-past have some relation to how the game is being played today. Nevertheless, we have to wonder what today's PGA leaders could do with the DIVNICK™ in their bag? We've had a lot of local pros comment that they love all the loft options. 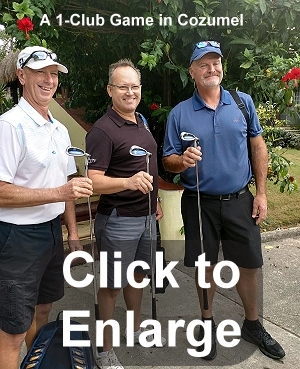 And of course, our goal isn't to persuade everybody to quit using their existing clubs, we just want to get everyone to add the DIVNICK™ to their arsenal or to use it when they travel. While some people use it as their only club even on their home course, we'd gladly settle for having the golfing masses add it to their traditional set or when they travel!!! You can read more about the development of the Adjustable, a link to our patent, and comparing it to other Adjustable's over the years. In summary, casual golf is about advancing the ball in beautiful surroundings with friends and colleagues. By making a little mental and physical adjustment with the DIVNICK™, we think you will come to agree that using it is a most enjoyable way to play the game. And it sure is easier than lugging a heavy bag around behind you, or schlepping it in and out of airports and paying the exorbitant baggage fees. Have fun, and hit 'em long and straight!